Carwyn Beynon's lasting memory of his great-grandmother was her "whispering in his ear" to reach for the biscuits - now he has set his sights even higher, on the peak of the tallest mountain in south Wales. Carwyn's "great nanny" Shirley passed away with vascular dementia in January. The five-year-old was so moved to do something in her memory, he aims to climb Pen y Fan and Corn Du this month. 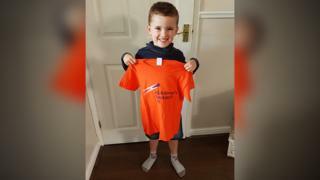 "He's one of the youngest fundraisers we have," said Alzheimer's Research UK. The schoolboy from Rhymney Valley was close to his great-grandmother, who he visited four times a week. "She always made me smile and still makes me happy and sad," said Carwyn. "My favourite memories were visiting her flat and her whispering to tell me to go get biscuits out of the biscuit cupboard. "I always remember visiting her in hospital, I liked that." "He said he wanted to climb Everest but we had a chat about doing something smaller to start with," said Amy, 33. "We decided to climb the two highest peaks in south Wales and when we asked Carwyn which charity he wanted to support, he chose Alzheimer's Research UK in memory of his great nanny. "She was a big part of his life. He obviously didn't understand the ins and outs of dementia, but knew her health was declining and she wasn't getting better." Carwyn will take on the challenge on September 15 with his mum and cousins Cath and Alexe O'Connor. Ceri Smith, of Alzheimer's Research UK, said money raised would help fund research into treatment for the disease. "We're delighted that Carwyn has chosen to support dementia research for his charity challenge and can't wait to see how he gets on." What are Alzheimer's disease and dementia?